The document management functions of enaio® streamline the creation of documents and information of various types and control how they are processed, accessed and exchanged between various persons. This solution thus helps you to efficiently control and organize the flow of information in your company. You and your employees gain full transparency over who made changes to which documents and when. Manage all data, information, and documents on a single platform. Manage documents professionally using a digital platform. Tailored to the requirements and needs of your organization. Unique variety of interfaces to Office, ERP, specialist applications, and many more. The document history provides information on editors and changes, and all relevant data remains visible at all times. The subscription and follow-up functions ensure perfect workflows across the entire business. enaio® manages all information and hierarchical filing structures on a central information management platform. ‘Intelligent objects’ are created from different document and file types, which in turn are combined into electronic records. 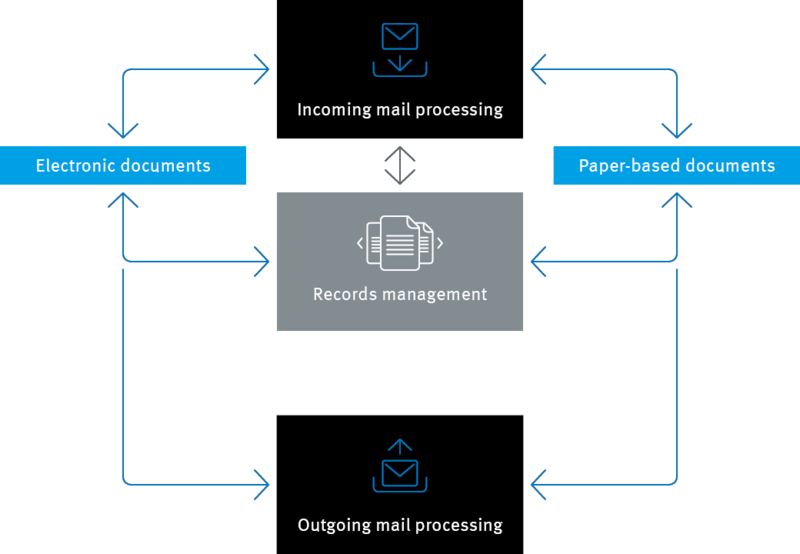 The e-records are used to manage existing information in a context-related manner, filter it regardless of its source, recombine data, exchange it with other systems, and make it available to all authorized employees anywhere and at any time. enaio® offers numerous options for the efficient handling of electronic documents. For example, Microsoft Office is connected via a plugin interface. This means that Office documents can be created and edited in enaio®. 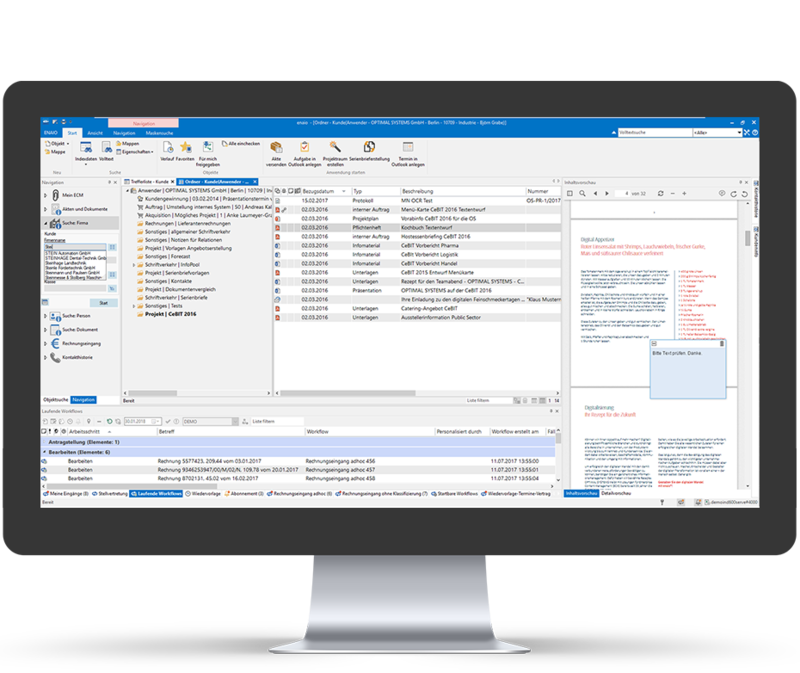 Thanks to sophisticated version management, enaio® users always work with the current version of a document. 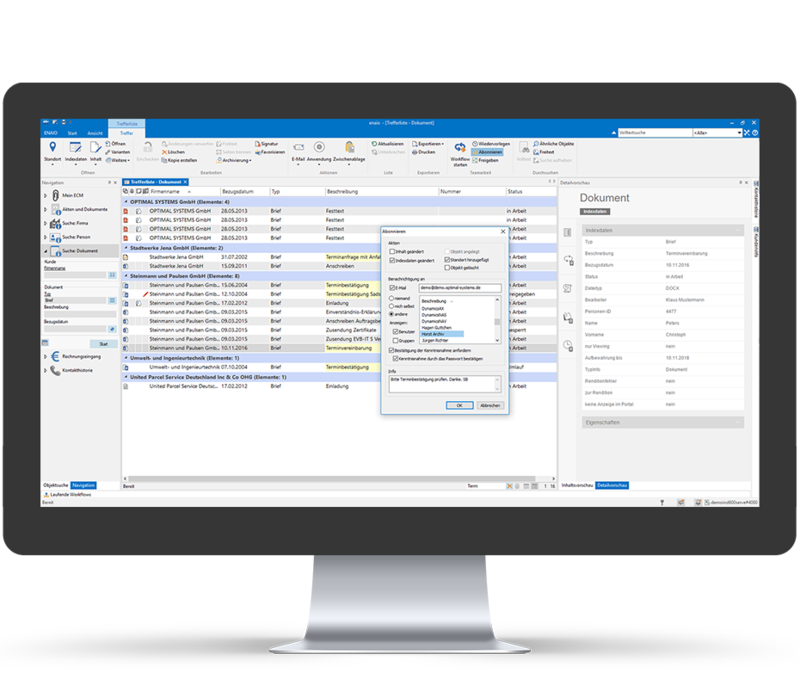 In addition, they can automatically transfer metadata, text modules, or other elements from enaio® into the document to be processed, including records, registers, documents, document parts, tables, or images. Managing documents with enaio® ensures efficient information processes. In addition to intelligent data search functions, this also includes the targeted forwarding and distribution of information. Both simple and complex search functions are available, ranging from one-click full-text searches to combined or expert search requests across multiple object types or hierarchy levels. The search results are provided in transparent hit lists and can be further refined in a subsequent step. 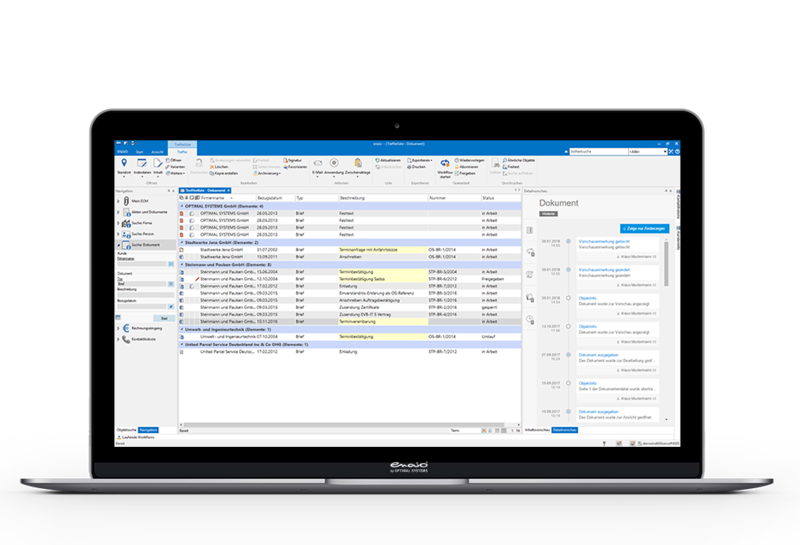 You can then conveniently distribute your information via digital workflows, internal links to the documents in the ECM system, or externally as e-mail attachments to collaborate with other enaio® users, employees, or even partners. Useful tools such as follow-up reminders and subscriptions further ease the workload of your employees. The storage of information and documents in enaio® already fulfills the requirements of simple archiving. If information needs to be stored over the long term, audit-proof archiving provides best results. It guarantees compliance with all relevant laws and guidelines with regard to evidential and audit-proof archiving, authenticity of documentation, and compliance with retention periods. enaio® empowers you to reliably comply with existing requirements regarding IT compliance and the GoBD accounting provisions. Incoming mail is directly mapped to enaio®. The load on external systems is significantly reduced by outsourcing data and documents. St. Galler Kantonalbank (SGKB) has introduced a new, efficient document management system that meets the latest requirements and optimally supports the work of its customer consultants. We use the DMS to prevent the same document from being stored in different formats and at different locations in the system or even printed out several times and passed on as a hardcopy. We chose OPTIMAL SYSTEMS because it integrates document management, archiving, and workflows into a single product.